“Ever heard of Abu Simbel?” I said, turning to Laura. 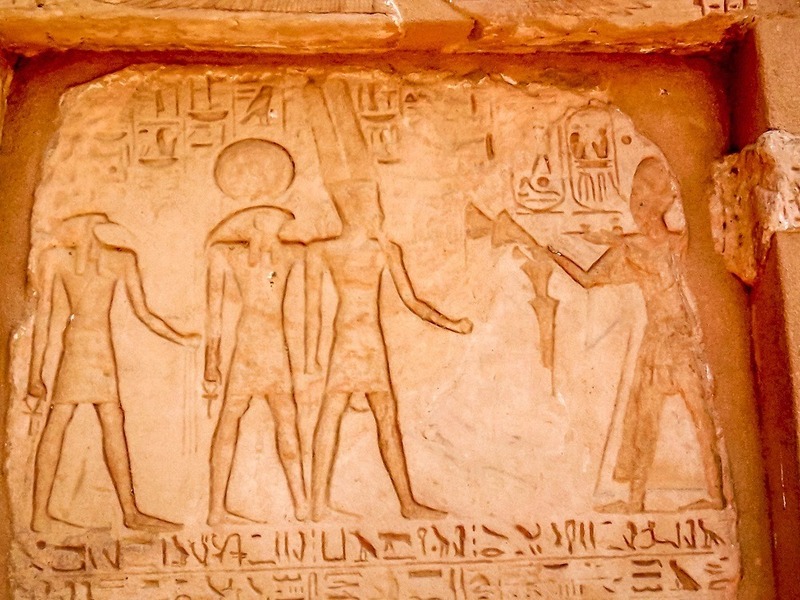 When we first received the itinerary for our Egypt trip, there were plenty of familiar sites—the Great Pyramid, Luxor, the Valley of the Kings. 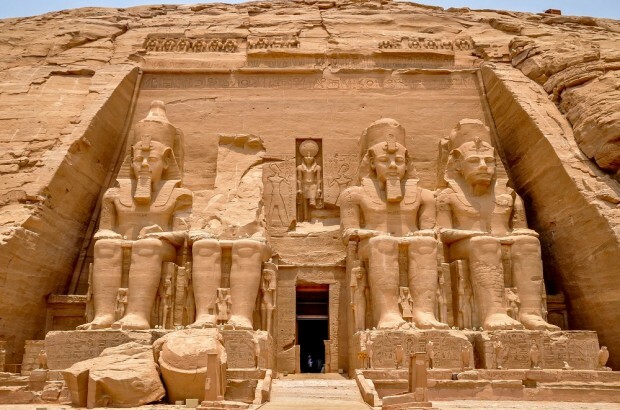 But Abu Simbel was a new one that sent us scouring the internet for information. From the moment we saw the stunning photos online, we were hooked. And then we had to wait six months to see it in person. In the interim, there was the Arab Spring, the January 25th Revolution, and volumes of uncertainty over whether we would be able to go to Egypt at all. So by the time the day came to plant our feet in front of this 3200-year-old monument, we were nearly jumping out of our skin with excitement. We got up early that morning and headed to the airport for our EgyptAir flight to Abu Simbel, the temple complex in Nubia just north of the border with Sudan. We were fortunate to have this included as part of our tour package, as the other option for visiting the site is a 7-hour round-trip caravan that leaves between 3am and 4am. 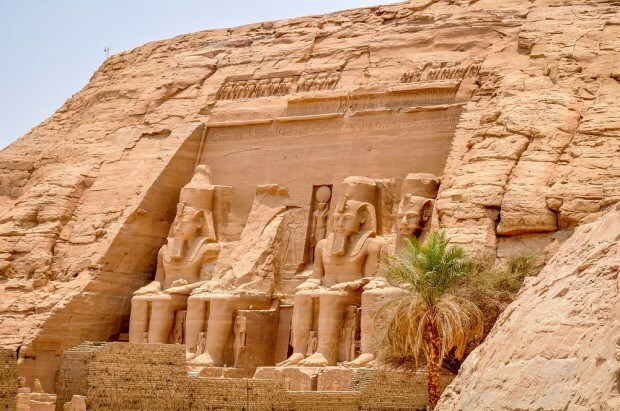 There’s not much near Abu Simbel and there’s just about nothing to the town. But that’s not why one would come here. 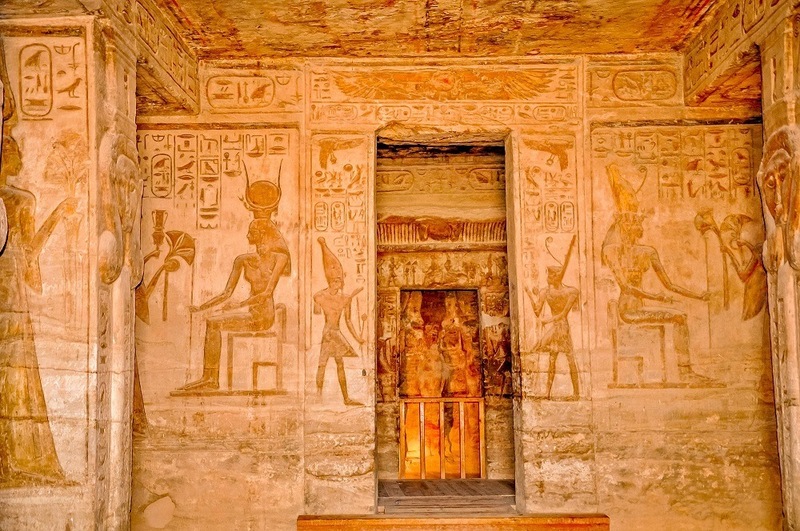 You come to Abu Simbel for the temples—the great monuments to Ramses II and his wife Nefertari. The stunning UNESCO World Heritage Site sits on a natural bluff overlooking man-made Lake Nasser where it captures the morning sunlight. But the monuments haven’t always been located in this spot. 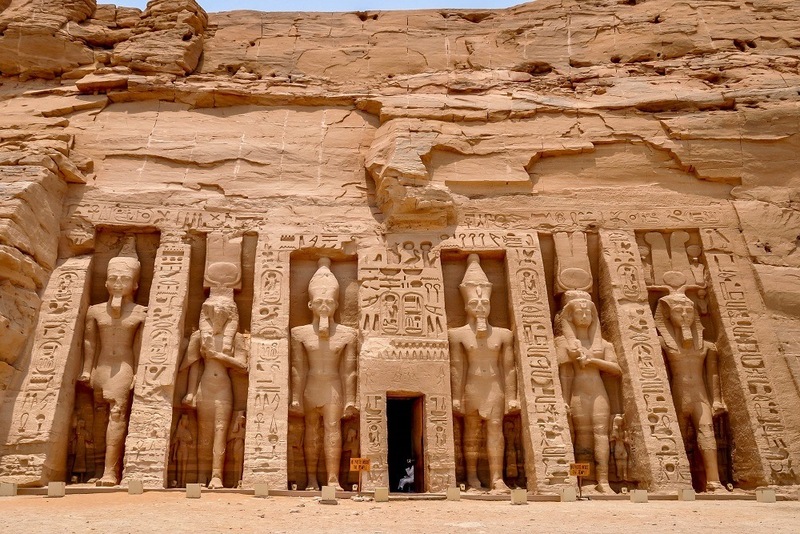 When work began at Abu Simbel in 1264 BC, the temples were some 65 meters below where they are now, carved out of a mountainside. 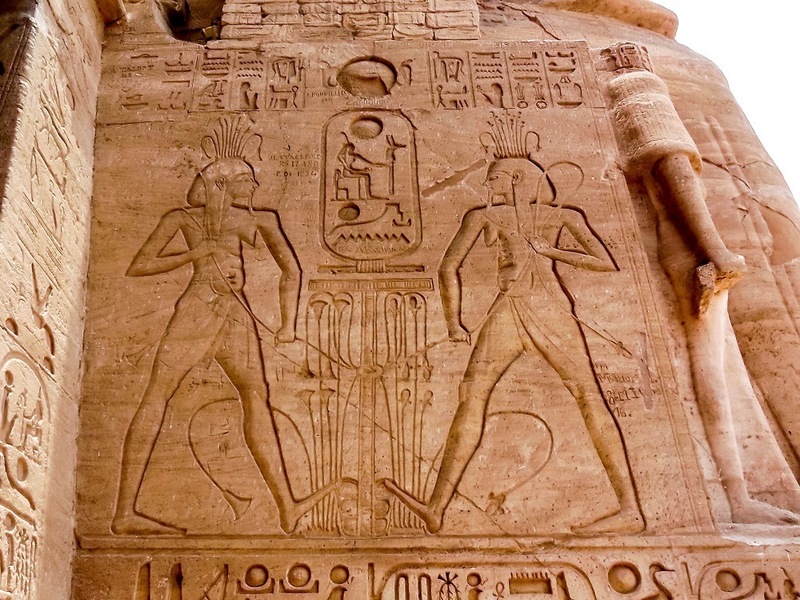 But the formation of Lake Nasser—necessitated by the building of the Aswan High Dam—threatened to destroy them. So between 1964 and 1968, the temples were painstakingly cut into 20-ton blocks and reassembled in their new location. Today, Abu Simbel is truly amazing again. 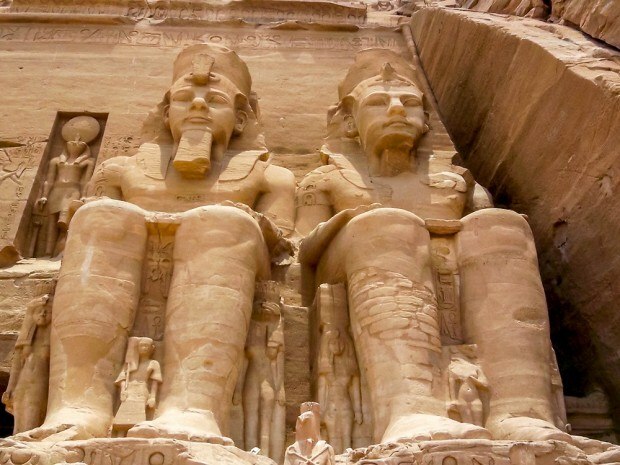 At the main temple, the four iconic statues of Ramses II rise up from nowhere, towering over visitors. The sandstone soaks up the sun’s rays and emits heat back like an oven in the already baking countryside. Inside, the intricate carvings tell the story of Ramses’s life (there is a lot of smiting his enemies with deathblows depicted). Photography is forbidden inside, which is a shame, though we did see that some guards allow people to take photos…for a price. Due to the decrease in tourism because of the Revolution, we had the chance to experience all of this almost alone. 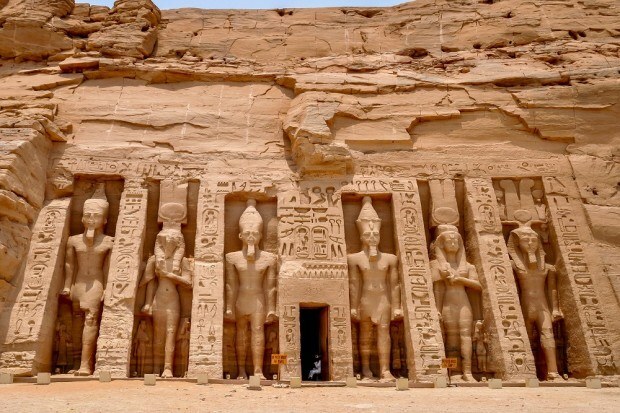 During our several hours marveling at the statues and artworks, there was no more than a handful of people at Abu Simbel, which would normally have been moderately busy. Though the challenges brought on by the conflict were apparent everywhere we went, we felt lucky to see this historic place safely. And without throngs of visitors, it was a unique and reflective experience. About 100 meters from Ramses’s temple sits that of his wife, Nefertari. The temple is smaller than the main site at Abu Simbel but still has stunning illustrations on the walls, many that still have color. The façade of this building is also remarkable with six statues of the king and queen. At one point, the guard allowed me to take a photo from the entry (naturally lit and not requiring a flash so as not to harm the decorations inside). A few moments later, the guard left, leaving our family of four as the only people anywhere near the building. It was truly amazing. What do you think about Alone at Abu Simbel in Nubia, Egypt? The photographs you took are really awesome, i didn’t know before that photography at temple is not allowed.